Ticket to Ride Nordic Countries takes you on a Nordic adventure through Denmark, Finland, Norway and Sweden as you travel to the great northern cities of Copenhagen, Oslo, Helsinki and Stockholm. Ticket to Ride Nordic Countries takes you on a Nordic adventure through Denmark, Finland, Norway and Sweden as you travel to the great northern cities of Copenhagen, Oslo, Helsinki and Stockholm. Visit Norway's beautiful fjords and the magnificent mountain scenery on the Rauma Railway. Breathe in the salt air of the busy Swedish ports on the Baltic Sea. Ride through the Danish countryside where Vikings once walked. Hop-on the Finnish railway and travel across the Arctic Circle to the land of the Midnight Sun. 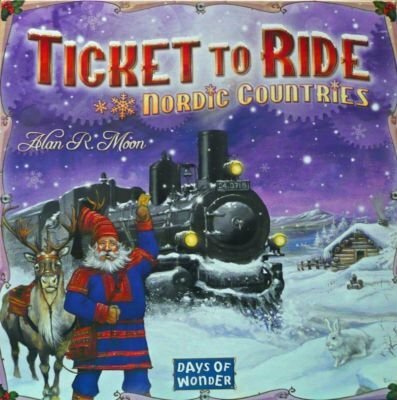 Players collect cards of various types of train cars that enable them to claim railway routes and pass through tunnels and onto ferries, as they connect cities throughout the Nordic Countries. As with previous versions, the game remains elegant, can be learned in 5 minutes and provides hours of fun for families and experienced gamers alike.